The ads for Andrew Lloyd Webber’s Cats used to claim “Now and Forever,” but it is his Phantom of the Opera that keeps running with no end in sight. Now in its 30th year on Broadway, the longevity record holder, this mega-popular musical has brought in an estimated $6.5 billion dollars worldwide. No wonder Lloyd Webber wanted to write a sequel to the tale of the horribly scarred, masked phantom and his singing muse, Christine Daaé. But what seemed like a can’t-miss project has been struggling to find its footing for the past seven years. 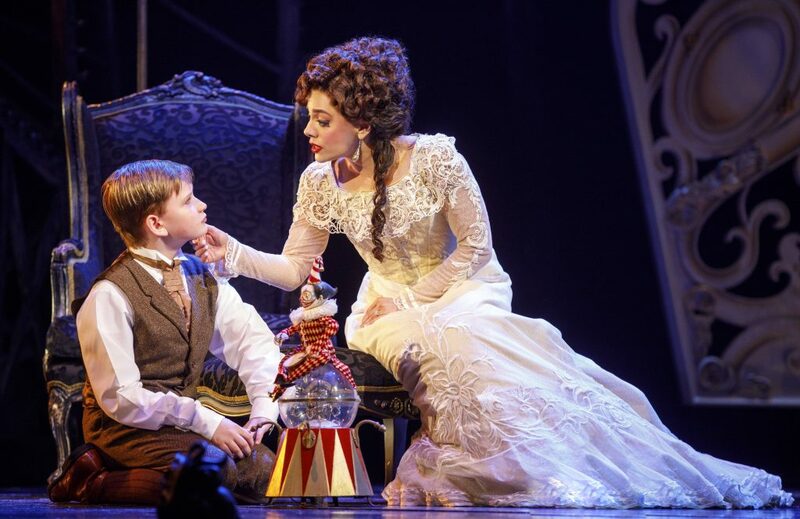 Now on a Simon Phillips-directed North American tour as it mulls an assault on Broadway, Love Never Dies retains its key asset – the curiosity and devotion of legions of Phantom fans – and its key liability – the inevitable comparisons to the earlier blockbuster show. If your interest in the show is learning what has happened to these characters in the ensuing 10 years since Christine chose Raoul, the Vicomte de Chagny, over the Phantom, the answer is “not much.” They do have a 9-year-old son, Gustave, but otherwise Christine remains conflicted over her mate selection. Raoul has become an alcoholic and has gambled away much of their money. So when Christine receives a lucrative invitation to debut at the Manhattan Opera House on Coney Island, she accepts and only later learns that it comes from – no spoiler, no surprise – the Phantom. Then she spends the rest of the evening bouncing back and forth between her love interests, when we know she is going to pick the Phantom this time. Lloyd Webber has again written a lush, romantic score, even more operatic than the one he composed for Phantom of the Opera. Shrewdly, he has laced it with musical themes from the earlier show, which – in part because of our familiarity with them – sound better than most of the new score. There is a very melodic title song which Christine trills at the climactic opera house opening and, after its use in reprises and underscoring, you are bound to have it rattling in your brain by the show’s end. Also memorable is a quartet (“Dear Old Friend”) sung by Christine, Raoul, Madame Giry (Karen Mason) and her daughter, Meg. The latter two, the ballet mistress and her fledgling ballerina offspring, you probably recall from Phantom. They too relocated to New York to be near the Phantom, in the hope that he would now take a shine to young Meg. She has jettisoned her high art aspirations in favor of starring in a Coney Island vaudeville. As Meg, Mary Michael Patterson struts her stuff in a couple of bouncy pastiche numbers with a chorus of bathing beauties. Tonally, Love Never Dies is darker than Phantom of the Opera. As relief from the gloom, the new show injects a trio of Coney Island clowns – Fleck (Katrina Kemp), Gangle (Stephen Patrovich) and Squelch (Richard Koons). They pop up at regular intervals, but have little to do with the show’s plot. No, Love Never Dies has no plummeting chandelier or jaw-dropping scenic equivalent, but designer Gabriela Tylesova provides stunning visuals for Coney Island, including a roller coaster track motif, a new-fangled horseless carriage and see-through obelisks in which grotesque creatures lurk. Her work is particularly impressive when you factor in the limitations of a touring production. Is Love Never Dies on par with Phantom of the Opera? No, but that did not seem to bother the Broward Center audience I saw it with last week. Still to be decided is whether to take the show to Broadway, which seems a no-brainer. If ever there were a critic-proof musical, this is it. LOVE NEVER DIES, Broward Center for the Performing Arts, 201 S.W. 5th Ave., Fort Lauderdale. Through Sunday, Nov. 19. $30-$160. 954-462-0222.